A tropical-like cyclone (TLC) / medicane is increasingly likely to develop in the southern Ionian sea on Friday. High resolution ICON-EU model is simulating a rather intense cyclone to develop with “tropical storm” strength and structure possible. This Medicane could eventually made landfall in WSW Greece on Saturday. Here is the latest 18 UTC ICON-EU model update on the potentially developing deep cyclone / medicane in the Ionian sea. ICON-EU model seems the most agressive one with actually a very intense warm core system with maximum sustained winds around 95 km/h, gusting up to 180 km/h! 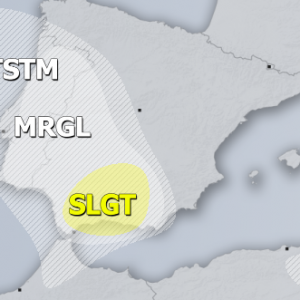 This would be strong Tropical storm intensity which is extremely rare in the Mediterranean sea. 12 UTC ICON-EU run was suggesting the medicane’s development and threat to W Greece already on late Friday. So still many uncertainties exist. Here is a comparison of 10 m and 850 mb winds. The 850 mb temperature reveals a solid warm core system! Stay tuned – we will have more updates with other model guidance tomorrow!